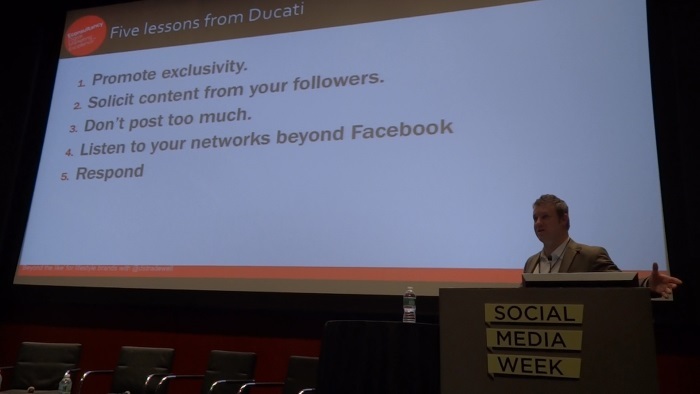 David St. John Tradewell of Econsultancy during Social Media Week 2013 in New York. The quest for likes may seem like the holy grail for marketers but building an engaging fan base is the key strategy that was demonstrated during Social Media Week 2013 with the panel Beyond the “Like” for Lifestyle Brands that featured presentations by Richard Jones of EngageSciences, Eve Sangenito of Brandwatch, David St. John Tradewell of Econsultancy, We Are Social’s Robin Grant. How do we get value from the existing community? Great things will be said by community, so how do you amplify that? Activation goes beyond post-engagement, so what are you learning about these individuals? Usually it is a number of fans that are engaged with your brands posts and campaigns so you want to see how you are re-engaging with your audience which includes, the need to think beyond how many likes do we get? Jones also states that engaged fans are what you are after so you need to understand the people behind those conversations to build the fan database to engage them. Also understand the value of your brand advocates since the top 5% of the brands following generate all the referral campaign conversions among friends of fans. Be sure to monitor social activity by setting up feeds from Twitter, Facebook, YouTube etc. Jones finished by stating that your community reflects how they are incorporating your brand into their lifestyle so publish the best of what your fans are saying directly into your social hub on your website or Facebook page. You can follow Richard Jones on Twitter: @oldstriker. Who is really talking about my brand? How am I faring against my competition? What sites best reach my audience? Eve concluded with a study that revealed hash tags at the start of the program have a 63% increase awareness but only 40% of companies used this strategy. You can follow Eve on Twitter: @esangenito. Robin Grant from We Are Social gave the final presentation on the social media strategy behind the new Jaguar. Since Jaguar is a luxury brand it has two audiences: those that can buy now and cheerleaders which cannot buy but appreciate the brand. So how do you engage the cheerleaders? Get them interested in the new Jaguar so they will have strong visual content. Grant also stated that fans interact with particular stories (Jaguar is the third most engaged brand on Facebook.) In 2012 Jaguar launched the new F type featuring exclusive content and putting influencers behind the wheel to experience the new Jaguar. Ridley Scott directed the short featuring Damian Lewis which resulted in 1.7 million fans on Facebook and 3.2 million views on YouTube.